Determining the location of a winning card would probably more difficult on an online scratchcard, of course, if you fancy your chances you can spin the wheel for up to 500 slot spins at this site which offers bingo games and slots. We suggest you don’t though, as you’ll probably lose. The likelihood of this winner using some sort of system to cheat seems to increase somewhat when one finds out she actually holds a PHD in Statistics from the University of Stamford. The fact she has also left her home state and moved to Vegas may also point towards her running some sort of scam and wishing to leave her past behind, or perhaps she has something greater planned in Vegas? Ginther is also reported to have been in cahoots with the store owner back in her home town where she had her first three wins, with this kind of access to the cards it would have been possible to count tickets and study them carefully, whether this alone would secure a win, we don’t know. Scratchcards are not the only gambling game that can be unravelled and predicted. Take Blackjack for example, this game can be manipulated to some extent by counting cards, if a player has a great mental capacity they can remember when a series of low value cards have been called and determine when it is likely that a high value card will be revealed. Whatever you think about the situation with Ginther, the locals in her hometown love her as she reportedly hands out unused scratch cards to share her luck! 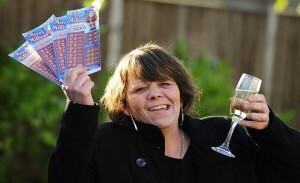 It is believed that these people think that her winnings are thanks to some sort of religious arrangement, until the authorities have proof, this reason is probably as plausible as any. This entry was posted in Scratch Cards and tagged Joan Ginther. Bookmark the permalink.